I’m not normally a New Year’s resolutions type of gal. If you decide you want to do something, you should do it any week of the year, any day of the week, any time of day. But last night, our house was finally quiet and I had time to reflect on what I’m looking forward to this year. With that in mind, I have a few things I want to work on in the near-future…I refuse to call them “resolutions,” but I am excited to have these goals to work towards! I am stoked to have a 13.1 miler to train for—I already feel motivated and amped to start my workouts and get back to more consistent running. I don’t know if I’m in any shape to PR for the half, but I’ll evaluate a time goal after I get a few longer runs under my belt. With a busy workweek, plus getting home after 6pm post-workout, I tend to fall back on cooking the same meals. I want to spice up my cooking life and try some new recipes, including a lot of lightened-up meals to help me shed a few pounds! And lucky you, lovely blog readers, you get to be the guinea pigs. 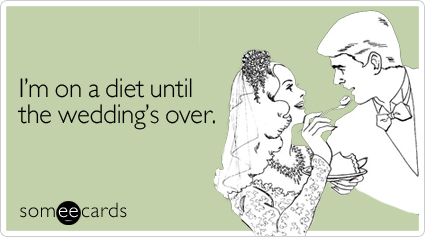 Alright, I gotta pull the cliché bride-to-be “I want to lose weight” card. I’ve wanted to do so for the last two years, so this will be good motivation, right? Losing 20 pounds should be easy to do before August. I love writing and it makes me happy, so I want to set more time aside every day to do what I love! 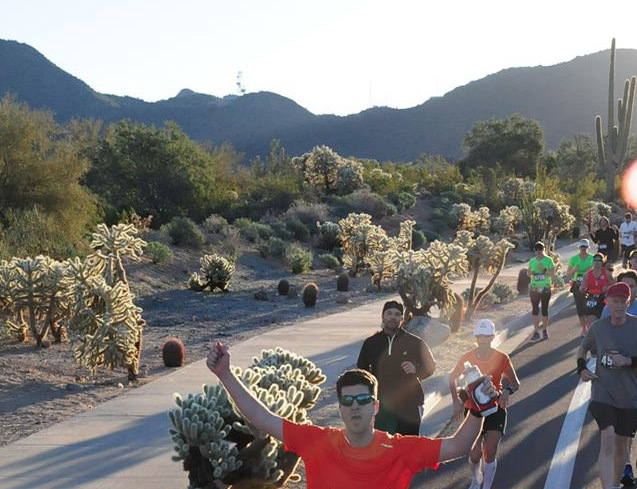 The granddaddy of them all: I signed up for my second marathon! 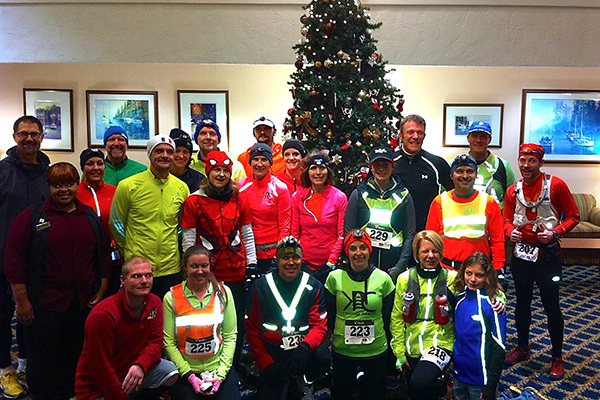 After I ran the Chicago Marathon this past October, I knew I wanted to run another marathon. 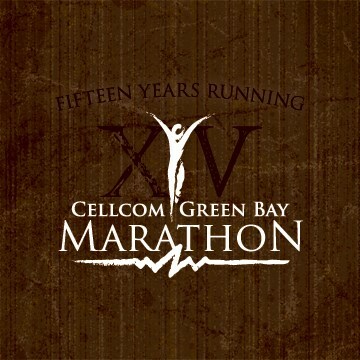 I felt like I could have trained better and run faster, so here’s to an injury-free year of running and a marathon PR at the Cellcom Green Bay Marathon in May. It’s been nearly a month since I ran my marathon, and tonight I’m [finally] planning to go for my first run since. I’ve read a lot about post-marathon recovery and how much rest time one should take. It’s no surprise that suggested recovery time varies depending on who you talk to. And, of course, that time also depends on how you felt during and after your race. Did you finish feeling good, with only (understandable) soreness? 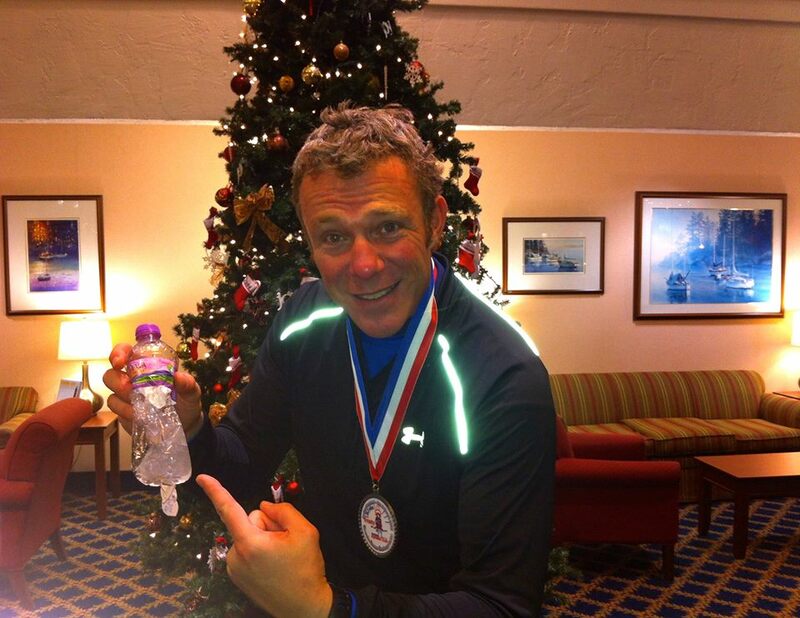 Or did you hurt during the race, something felt injured, perhaps you were limping around when you finished? If that’s the case, you need some extra time off your feet to heal. We all know running 26.2 miles is a HUGE stress on your body, and even your mind. The training leading up to it can also impact your social life, work life, and other aspects of your everyday well-being. For those reasons, I think it’s even more important to take ample time off after a marathon to not only let your body heal, but also so you play catch-up with those other areas of your life: family, friends, work, neglected home duties, etc. I’ve heard for years that elite runners take off one day for every mile of a race, so typically they’ll take around 21 days off after a marathon. THREE weeks?! 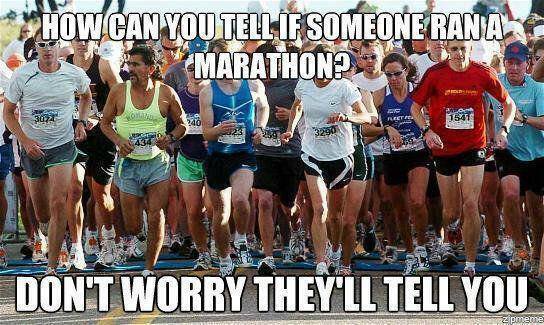 Most runners out there cringe thinking about taking that much time off. In my case, I felt I needed to take at least a whole week off of ANY working out after the marathon. My right knee hurt quite bad right after the race, so I knew the overuse had probably done a little damage. Plus, I was looking forward to the mental rest, being able to come straight home from work and relax, sleeping in on Saturday morning, working on organizing & setting up neglected rooms in our new home, and more. I told myself I could take two weeks off completely, and I didn’t feel guilty about it one bit. By week two, I was starting to crave the run again: The cathartic steadying breath, watching the scenery float by as my mind cleared of all thought, the sweaty feeling of triumph after pounding out the miles. And that’s SO important! After 5 months of training, it’s easy to get burned out on running. Take some time off so you can remember how much you love it, what it means to you, and don’t start again until you WANT to—not because you feel you HAVE to. I have several friends who had signed up for races after the marathon, who felt pressured to get back to running after just a few days off. Don’t stress yourself out like that, don’t make yourself HAVE to run. Want to. Right when I planned to pick up running again, I came down with this cold/bronchitis terrible twosome. But yesterday, feeling 95% back to normal (minus a naggy cough), when a friend asked me if I wanted to join her for a run this evening, I knew it was time to jump back in. I’ve felt ready for it, I’ve been craving it, I’ve been feeling that tickle in my feet to get back out there. And I couldn’t be more excited for it. How long do you take off to recover after a big race? What do you do to recover? Luckily, you’re all here voluntarily. I shuffled around; groaned a lot; and had trouble lifting my legs, er, at all. I popped Advil like it was my job. Stairs were a joke. Sitting = heavenly. My right knee felt like a 90-year-old’s. I probably looked like a 90-year-old. Passersby and strangers stared a bit—I just made sure my medal was blingin’. Why yes, I feel like I’m about to fall over and I’m caked in salt. Please take my picture. Walking was halfway back to normal. My knee felt akin to a 70-year-old’s knee—quite painful going up and down the stairs. Working from home, sitting on the couch with my legs propped up, was the best ever. But, every time I stood up, the soreness came flooding back like a tidal wave. Ooph. With slightly less leg achiness came newly sore body parts—my back, my shoulders, my lower abs, my arms. What a lovely surprise! I wanted to go to bed by 7pm. Popping all that Advil over the last few days must have helped. Walking around felt pretty normal. But, after sitting at my desk for an hour or more, getting up and stretching my legs felt like straightening out tightly-wound Slinkies. My knee was progressing to a 60-year-old’s doesn’t-yet-need-to-be-replaced knee. My appetite was voracious. My fatigue was returning to normal, and I stayed awake until almost 9pm. Woo. The return to normalcy! Walking, sitting, standing, even squatting to pee = normal. Joy. Only the outside of my hips still felt a bit sore, and that was only if I jiggled them around weird to see if they still hurt. Ha. The pain had worn down, the euphoria was still in full-swing, but with passing time the marathon began to seem like a dream. * My appetite wasn’t slowing down. A giant bakery cupcake may or may not have made a minor appearance at dinner before disappearing into my bottomless pit of a stomach. I’ve enjoyed taking the last 10 days off from running. I’ve been relaxing, getting a lot of ignored housework done, and just spending time with friends and family. It’s nice not rushing to leave work to go run before it gets dark; or just simply come home after work to make dinner and relax the rest of the night with my fiancé. But, the itch is creeping back up…The urge to run and see how these legs feel again…To get out in the crisp air, eating it up by the lungful as my feet kiss the road and leave it behind me. Soon, I will get back out there. But not today. Today, I’m enjoying the triumph for just a while longer. 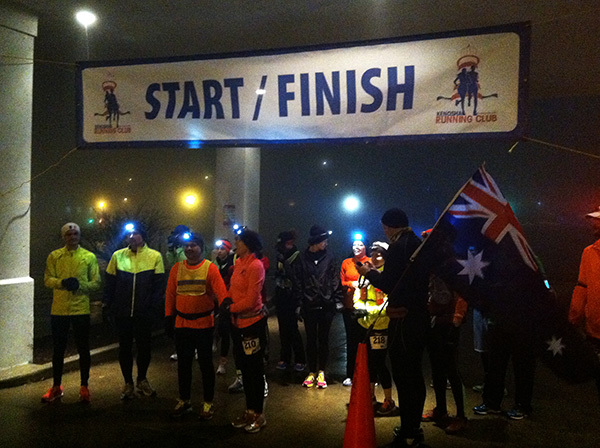 How do you feel mentally and physically after you reach a big goal or race? How long do you take “off” afterwards, to recharge yourself? My running buddy Liz finished the Chicago Marathon, but it didn’t quite go as planned; then she went on to run a half marathon last weekend with a PR for the year. Wow! I guess we all recover differently, huh? Here’s a recap of my week #2 marathon training. All in all, a solid week. I am feeling good mentally & physically! I did my long run on Sunday instead of Saturday, thanks to a traveling mishap on Saturday. I waited to start until almost 9am, which wasn’t so smart since it was about 75 degrees when I started, and 85 degrees when I finished. It was a hot one! I went slow & steady since it was my first long run, and I stopped at home to refill my water bottle with ice water about halfway through, so those things helped me to feel pretty good throughout. Easy recovery run along the lakefront kept it breezy & cool. Tuesday: Was supposed to cross-train by biking, but it was rainy/stormy out, so I did some core work & Pilates strengthening inside. 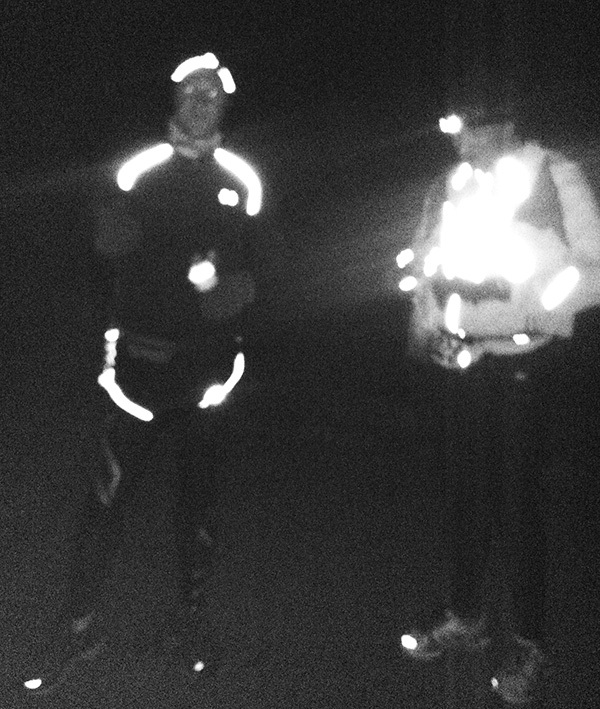 Ran with my training partner for a nice, easy 5 miles. Goes by so much faster when running with a friend! Ran along some roads in the hot sun & HIGH humidity. Sweat didn’t even seem to drip off…just stuck there. Gross & was glad when it was over. 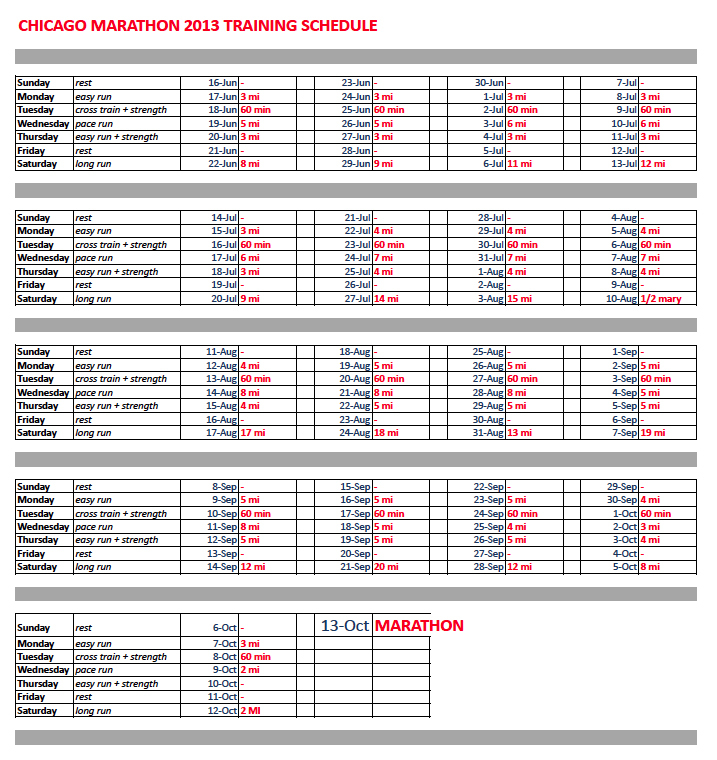 Let’s take a look at what’s ruling my life these days…marathon training! Running a marathon is truly something I never thought I would do. Over the last couple of years, I’ve run many races & distances, including a handful of half marathons, with a PR of 2:11. The dedication and time it took to run 13.1 miles, and the few injuries that cropped up during those times, were enough to make me swear off even the idea of running 26.2 miles. Then this past January, something changed. During a “run-cation” (vacation + running race) with my two sisters in Florida, they talked me into signing up for the Chicago Marathon so we could all run it together. Translation: They will finish over an hour ahead of me, and I will be cursing them as I near the 20-mile mark & they’re already celebrating. I missed out on the speedy runner genes, apparently. I’m still not sure what it is that changed my mind… Maybe it was the fact that we’d run a half marathon in the Florida heat that morning and our wine flights at dinner were going to my head. 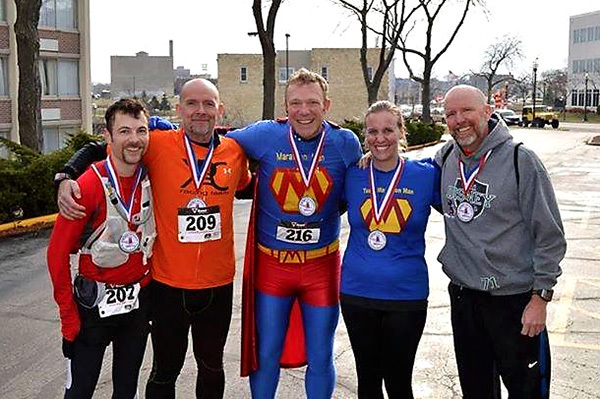 Maybe it was the fact that a half marathon used to seem like an insurmountable task to me, but then, even when I slacked on my training, I was still able to finish 13.1 miles. 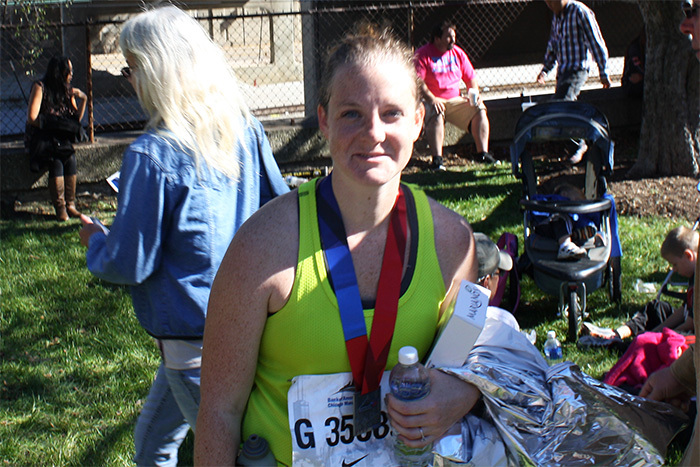 It wasn’t pretty, and it wasn’t pretty easy, but a half marathon also wasn’t an impossible feat anymore. So I needed a bigger challenge. Why not take that conquest on with my sisters, my best friends, by my side? My sisters & me after the Naples Half Marathon. I’m giving myself the flexibility to switch around days and workouts, especially with the summer heat about to descend upon us here in Wisconsin, and all the fun activities that pop up in the sunny summertime months. It seems like here in Wisconsin, we get 3 months of great weather, followed by 9 months of winter, so I have to enjoy the sunshine while I can! Each Monday, I’ll post the week’s upcoming workouts, and a recap of the past week’s so I can keep an eye on my progress & stay accountable. Any words of advice for a marathon newbie? Do you have a specific training program you prefer to follow, or other fitness that you incorporate into your routine to help you?